The American poet, author, journalist and inventor Charles Henry Webb was a very interesting person. Born on January 24th, 1834, in New York, he received his preliminary education in his native place, and in early youth he ran away to sea. He was absent three years, and on his return went to Illinois, to which state his parents had removed in the mean time. Then he had been engaged in business on the banks of Mississippi river from 1856 till 1860, dealt subsequently in wheat in Chicago, take part in the American Civil War, and at a later period was a banker and broker in Wall street, New York. 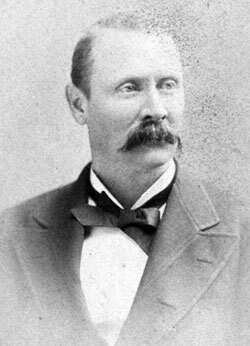 He started his career as a journalist in the newspaper New York Times in the beginning of 1860s, later moved to the San Francisco Bulletin, then edited The Californian, a weekly, and was a correspondent of the Sacramento Union. Besides the calculating devices, which will be examined later in this article, in 1874 he invented, patented, and manufactured a cartridge-loading machine, the utility of which was recognized by the manufacturers of fire-arms and others. He was a friend of Mark Twain and was known for his humorous social criticism and published several travesties and plays. Charles Webb died in New York on May 24, 1905. 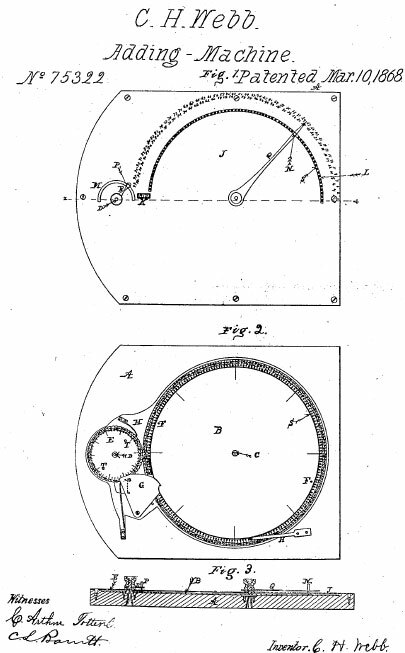 Charles Webb was a holder of several patents for calculating devices. 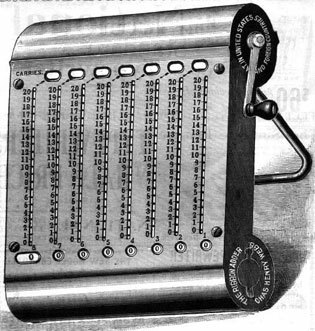 First was the USA patent №75322 from March, 1868 for an adding-machine. Later he will be granted two other patents for improved version of the same device, pat. №414335 (granted to his assignor L. Smith) and pat. №414959 from November, 1889. He is holder also of two patents for another adding machine, so called Ribbon Adder. The second machine Webb devised in 1886, when applied for USA and English patent, but he had some problems with the application, and was granted a patent for this device first in England in 1888, then in USA (pat. №465120 from 1891). We have an innate and hereditary hatred of all of the order ophidian, and we much doubted the expediency of receiving Mr. Webb’s reptile into our office, but having seen the animal and found it was no "snaik" whose head was to be crushed, but an industrious little device calculated to save head-wear, we welcomed it cordially. Its appearance is similar to the accompanying engraving, the implement, however, being larger, measuring about six and three-quarter inches long by about five inches across the widest place. The form is seen in the engraving. A large disk, A, and a small one, B, both revolving, and both graduated around the circumference and marked with figures in two concentric circles, are seated in a case and and partially covered with a metallic plate, leaving only the inner circle of figures exposed, except at a small opening between the two disks, where one set of figures, on the outer circle of each, is seen through the slot in the plate. The plate around the larger disk is marked from 0 to 99 the correspond with similar numbers on the disk’s concentric circles. 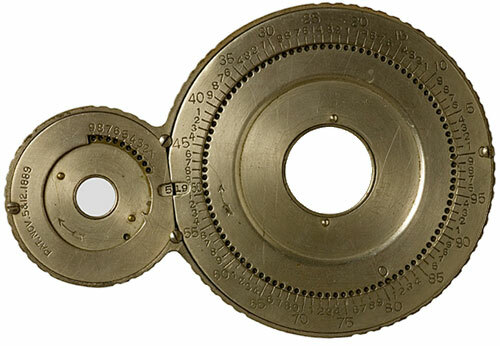 The smaller disk has 50 numbers, from 0 to 50, with a corresponding segment of numbers (units) from 0 to 9 ranging from the opening in the plate or cover back around a portion of the smaller circle. The larger disk has on its under side a ratchet with a single tooth and the smaller one a ratchet of fifty teeth. A connection is made between the two by a spring pawl so that one entire revolution of the large disk will move the small one one-fiftieth of its circumference. The operation may be comprehended by the above description of the parts. The Inventor believes that it is a great aid to accountants, substituting a merely mechanical process for mental or brain labor. Certainly if his manipulation of the device, and the opinions of these who have given it a trial are to be considered, the implement should be estimated as a valuable adjunct to the means of summing up wearisome columns of figures. It may be let in flush with the surface of a desk so that the accountant, or clerk, may always have it at his elbow, working it with one hand while keeping his place in the columns of figures with the other. It is neat, handy, and presentable, but although it will add numbers rapidly, it is doubtful if it will add to a man’s fortune or to his family. With this drawback we can indorse the adder. Orders for the implement or for explanatory circulars should be addressed to the patentee, C. H. Webb, 571 Broadway, New York city. The Webb Adder was imitated by a number of brands such as Lightning Calculator. The second calculating device of Webb was so called Ribbon Adder. It seems for the first time the Russian Юрiй И. Дьяковъ (Juri I. Diakov, see the new type abacus (новаго рода счеты) of Diakov) suggested in 1874 that one might represent numbers on an adder by a set of continuous bands. Actually Diakov was the inventor of several interesting calculating devices, which were granted with a medal on 1878 Exposition Universelle in Paris. Webb picked up this idea and devised his quite clever device in the middle of 1880s. 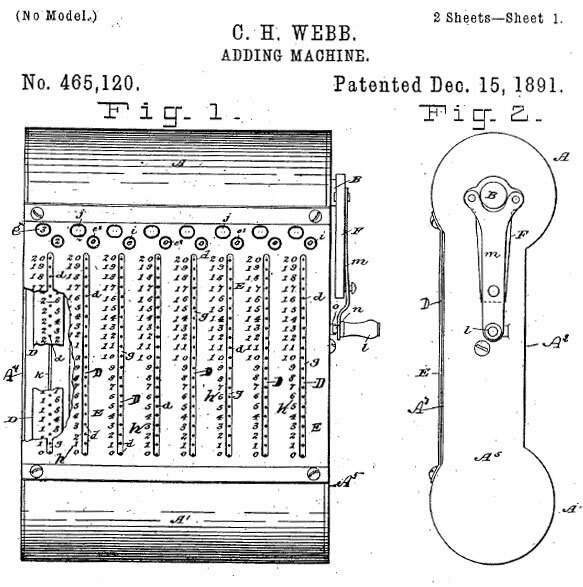 He applied for a patent in the U.S. in 1886, received one in England in 1888, and patented the Webb ribbon adder in America in 1891 (see the lower patent drawing). Webb however had some problems with the patent of this device. When he overcame the delays associated with patent problems and obtained the patent, the depression of 1893 proved more than he could handle. Webb’s Ribbon Adder didn't reach the market success of the first adder and soon disappeared from the market. Let's see a short description of the device. 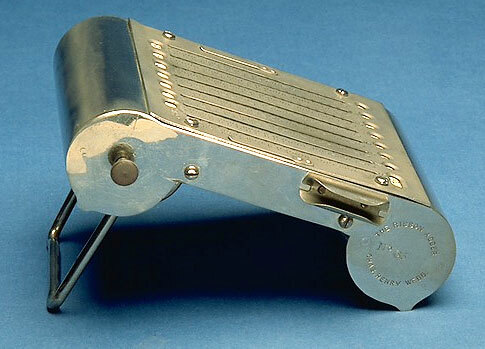 This chrome-encased instrument (see the nearby figure), with overall dimensions: 5.3 cm x 14.3 cm x 15.5 cm, has 8 grooves for entering the digits of numbers with a stylus. The grooves are labeled 1-to-20 on the housing, giving a user the curious “convenience” of being able to add up to 20 in a single stroke. Inside, beneath the grooves, are long metal ribbons with regularly spaced holes. The holes are numbered to their right with the digits from 0 to 9 repeating sequentially all along the ribbon. These digits appear in windows below the grooves as amounts are entered. The same holes are also numbered to their left, with a total of 10 holes numbered 0, ten 1’s, ten 2’s, and so forth up to ten holes numbered on the left 29. These figures appear in windows at the top of the grooves and represent numbers to be carried. To enter a number, one pulls down the ribbons for its digits. The corresponding total appears in windows below the grooves. Digits appearing in the windows at the top must be carried into the adjacent left column. Any one strip of this adder can be used to add sums totaling 299, or to enter a 9 and carry 29. Later on the principle of Webb's Ribbon Adder will be used in some popular devices like The Basset Adder.